Hamilton, ON (August 8, 2017) – Research from McMaster University has identified new regulators of brain metastases in patients with lung cancer. These regulators are the genes called SPOCK1 and TWIST2. The discovery was made by researchers at the Stem Cell and Cancer Research Institute at McMaster University and was recently published online in the journal Acta Neuropathologica. 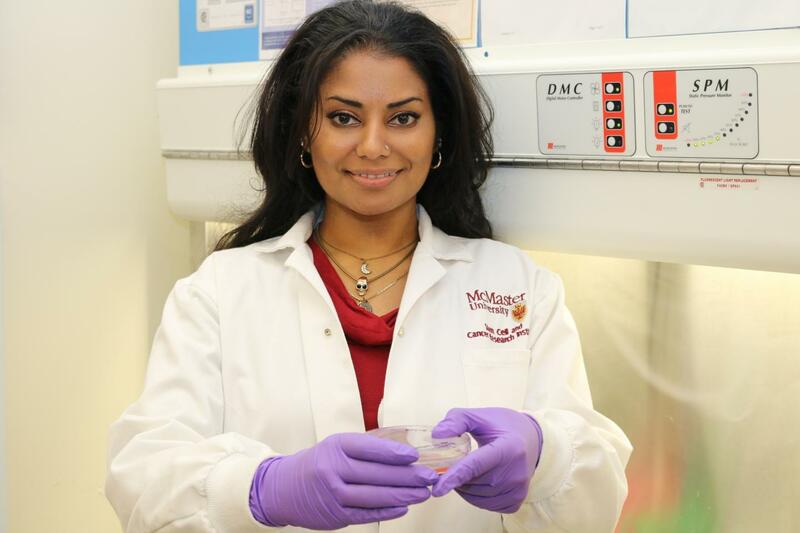 "Brain metastases are a secondary brain tumour, which means they are caused by cancer cells that escape from primary tumours like lung, breast or melanoma, and travel to the brain," said Mohini Singh, the study's primary author and a PhD candidate in biochemistry at the Michael G. DeGroote School of Medicine at McMaster. "We set out to find which genes can regulate the cells that initiate brain metastases, which we've termed brain metastasis initiating cells or BMICs. In other words, what are the genes that are sending the signal to these lung BMICs to leave the lung tumour, go into the blood stream, invade the blood-brain barrier and form a tumour in the brain." The study used samples from lung cancer patients with brain metastases. The samples were incubated to enrich for BMICs, then injected into the lungs, hearts and brains of mice. The subsequent development of brain metastases was studied by researchers. "If you look at a set of lung cancer patients, like we did in the paper, who develop brain metastases, they all have those two genes in their primary lung cancer," said Sheila Singh, the study's supervisor, associate professor at the Michael G. DeGroote School of Medicine, scientist with the Stem Cell and Cancer Research Institute at McMaster University and neurosurgeon at McMaster Children's Hospital. "Patients who don't get brain metastases don't have these genes in their primary lung cancer." Brain metastases are the most common brain tumour in adults and are a leading cause of death in cancer patients. "If you can identify the genes that cause metastases, then you can determine a predictive model and you can work towards blocking those genes with possible treatments," said Mohini Singh. The research was funded by the Department of Surgery at McMaster University, the Ontario Institute for Cancer Research Cancer Stem Cell Program, a Canadian Cancer Society Research Institute Innovation Grant, the Brain Canada Foundation and the Boris Family Fund for Brain Metastasis Research. In addition to McMaster, additional authors on the study came from St. Joseph's Healthcare Hamilton, the University of Toronto, the Donnelly Centre, Princess Margaret Cancer Centre and the Hospital for Sick Children. Editors: Photos of Mohini Singh are attached.